The holiday shopping season is upon us and it is time to figure out what to get the kiddos. For the past 2 years, I've really been trying to avoid the plastic, flashy, noisy toys that don't last and opt for better quality things. This can be challenging since your major chains carry most of the same things. I don't want any more toys that break easily and will be junk in a year or two. No, I want things that will be educational and also last a lifetime. So when I came across Automoblox, I new I had found a great toy. 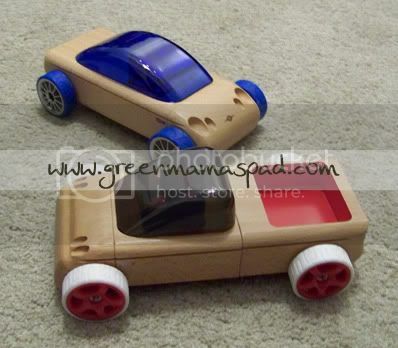 Automoblox is a line of high-quality wood, interchangeable cars and they are available in two sizes: original and mini. These cars are meant to be heirloom toys - ones that can be passed down to the next generation instead of thrown in the trash. Not only will they provide hours of fun as your child builds his/her cars but they also provide learning benefits like creative problem solving, gross and fine motor skills and visio-spatial processing. Recommended for ages 3 and up. We've merged the fun factor of classic car toys with the warmth of natural wood, richly colored roofs and bright rubber tires to create a design system that stimulates creative thinking and excites the tactile and visual senses of children at any age. And by combining the open-ended play of wooden blocks wit the cognitive challenges of shape sorters and puzzles., we've created a play system loaded with the healthy developmental benefits that are so necessary for today's kids. Automoblox was generous enough to send us 2 vehicles to test out: the T9SE in red and the S9 Sedan in blue. As a parent, I have to first say how impressed I was with the quality. To test out the durability, my husband decided to toss one across the family room (took me by surprise) and the car emerged victorious. What makes these cars so very fun is the ability to take them apart and reassemble them. Every single part comes off easily and my son enjoys simply putting them back together again. And the little people that sit in your car have little shapes at the base (shape sorting) and each have their designated seat inside the car. Probably the coolest feature of Automoblox is that if you have more than one car, you can interchange parts and make your own original, fun designs. The possibilities are endless from simply mixing up wheel colors to creating a whole new vehicle. Here are a few that we came up with. 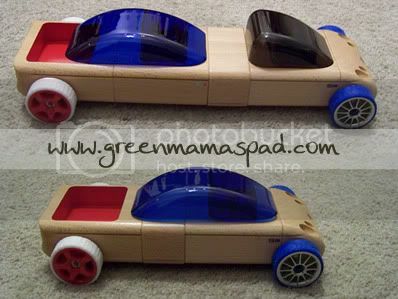 While my son went for a more classic look in the bottom vehicle, my husband created what he called a "stretch limo" in that top one. No matter how you put them together, it sure is fun! For a demonstration of just how easy it is to interchange parts, you can watch my quick, 1-minute video. Overall, the whole family had a lot of fun with the Automoblox cars. While I am keeping them away from the 2.5 year old twins at the moment (I fear they will lose parts on me) I know that these cars are ones that can be passed down to each one of my boys and that they all will enjoy them . There is some very exciting news in the Automoblox world and that is the launch of two vehicles: the new T900 Truck and the new Hot Rods. 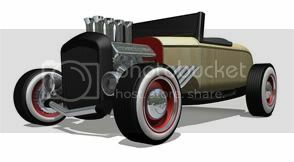 Below is just a rendering of each, but you can see photos of the actual vehicles on the Automoblox Facebook page. These will be sold exclusively at Automoblox.com should be available to order in early December. Automoblox vehicles may be purchased directly at Automoblox.com which is currently offering free shipping on orders over $60. Use coupon code ship60 at checkout. One (1) winner will receive their choice of the A9 Original Size Compact Car or the T9, S9, C9 3-Pack. 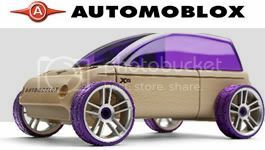 Visit Automoblox.com and tell me which vehicle is your favorite. 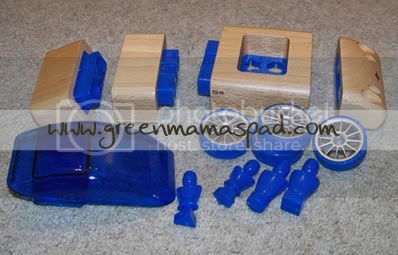 - Follow GreenMamasPad and Automoblox on Twitter and and tweet this giveaway. You can tweet once daily. Leave link to tweet in comment. - Become a fan of Automoblox on Facebook. This giveaway is open to US Residents 18+ only and will end on Friday, December 4th at 11:59pm EST. One winner will be chosen at random using Random.org and will be posted on the Winner's Announcement page. Winner has 48 hours to claim his/her prize otherwise a new winner will be picked. You must leave your e-mail address in all of your comment(s) so I can contact you. I will not share your e-mail address with anyone, it will strictly be used to notify you if you win. Good luck! Please note that the opinions and views expressed in this review are my own and based on my personal experience with the product. You may encounter a different experience with this than I did. Automoblox provided me with an item for review and is providing an item for the giveaway. Tristan likes the T900 Truck the best. My daughter really loves the pink C9p sportscar. These things are really cool! I like the original C9p (that's the pink one). DD would get a kick out of it. I love the S9 sedan! and oh, yes, i'm a facebook fan! My son would LOVE one of these! What a great Christmas present!! I'm loving the S9 Sedan - but I like them all!! I really like the Mini T900 truck. My son loves trucks. He would really enjoy this! I like the T900 mini truck. Thanks for the chance. fan of Automoblox on Facebook. I really like the Mini C9-R/S9-R/C9-S 3-Pack for my boys. These is something they both can share and enjoy for a long time. I grabbed Green Mama's Pad button. I'd get my son the 3 pack! These are soo neat! Wow! i'd definitely get the 3-pack. that T900 truck is awesome, too! My four year old loves ANYTHING cars and i'm SO SICK of junky toys that break. these look so amazing! i'm afraid to show my hubby the Website! I've gotta go with the C9 sports car. I bet my son would get a kick out of it! I'm a fan of Automoblox on Facebook. I like the X9-X Sport Utility! The T900 truck is my favorite-love pickups! I like the C9p sports car! My favorite car from the website is the X9 sport utility. If I won, I would choose the C9 3 Pack. Our favorite vehicle at Automoblox is the T900 Truck. I am a fan on Facebook as Jill Myrick. I am a fan of Automoblox on Facebook as Jill Myrick. I like the T900 Truck. I like the S9-R sports sedan. So fun! I love the T900 Truck and the Mini T9/S9/C9 3 pack. I love the T900 truck! Very cool cars! I would pick the A9 if I only had one child, but maybe the 3 pack would be better since I already have 2 boys and I'm PG with #3.
totally love the HR1 hot road! definately cool! I really love the trucks especially the T900 newest truck.